Blending both Hindu and Muslim elements into its architecture, this is thought to be the only monument from Mughal times built by a Hindu in Agra - Jaswant Singh. 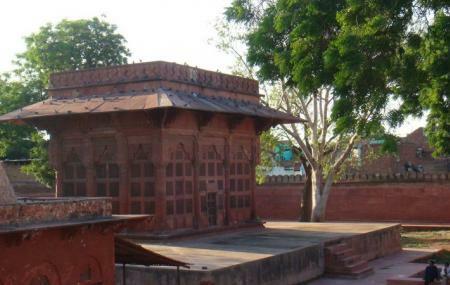 It is a domed, pillared, pavilion-shaped cenotaph, dedicated to Rani Hada, a princess from Rajasthan. The tomb of the queen is in the centre of the garden. It is surrounded by a rectangular wall of red-sandstone. Drive to here, take an auto rickshaw or tonga. Love this? Explore the entire list of places to visit in Agra before you plan your trip. Fancy a good night's sleep after a tiring day? Check out where to stay in Agra and book an accommodation of your choice. How popular is Jaswant Ki Chatri? People normally club together Chini Ka Rauza and Kalakriti while planning their visit to Jaswant Ki Chatri.